War has become the greatest instigator for the advancement of science in this the 21st Century. Developments as diverse and far-reaching as space travel, superglue, duct tape and microwaves owe their origins to inovations of the Military Industrial Complex and its advancement into the domestic landscape. head-mounted displays (HMD) or VR glasses such as Oculus Rift. 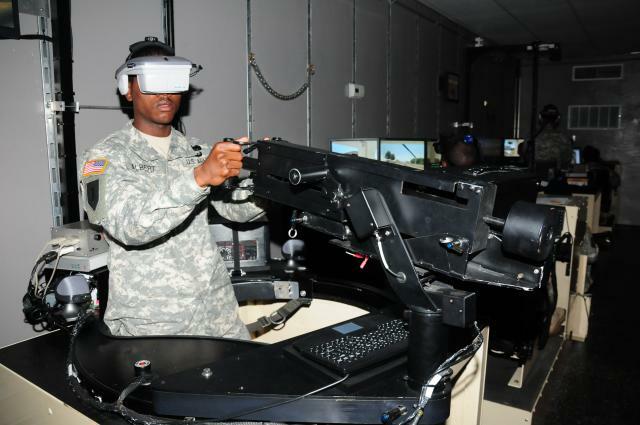 Simulations include the administering of first aid to wounded comrades while under enemy fire, in a realistic 360-degree 3D environments that change view with the movement of the head and the body, by an in built tracking system. Troops are also training with integrated feedback that administers a small electric shock when the soldier gets ‘shot’. The US Department of Defense is so committed to the project it wants every soldier to have a customised virtual avatar modified to reflect their individual skills and weaknesses. 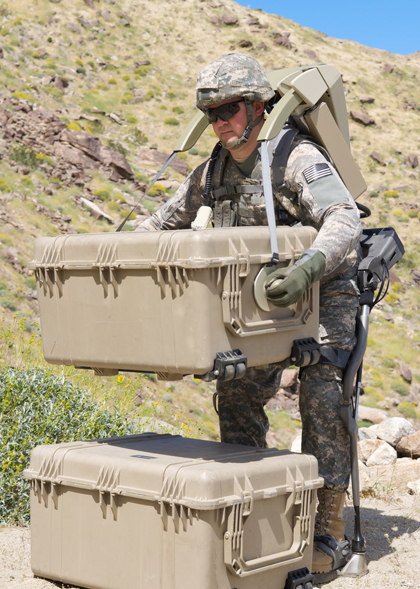 While many current exoskeleton projects have medical uses in mind, XOS and XOS 2, developed for the US Army by Raytheon-Sarcos, Hercule by firm RB3D, and Human Universal Load Carrier, better known by its acronym HULC, are primarily military. As with the Hulc developed by Ekso Bionics and Lockheed Martin, is a lower extremity exoskeleton powered by a lithium-ion battery that works to redistribute the weight across the hips and legs, allowing its operator to comfortably carry 200lbs (91kg) with less effort. 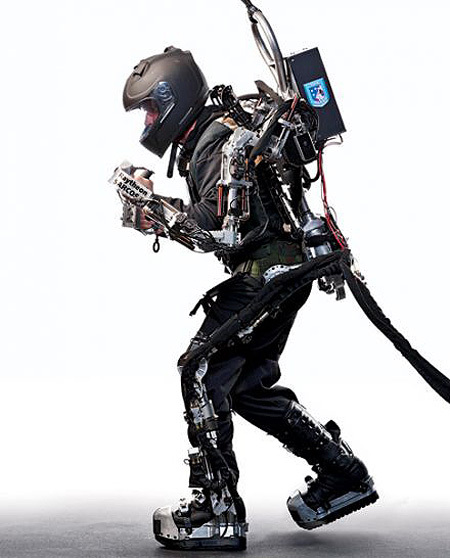 Far more flexible than earlier exoskeletons, sensors mounted throughout Hulc’s titanium frame and linked to an on-board microcomputer spur electric motors into action allowing the limbs to match the operator’s movements. Lockheed’s ambitions is that the system will allow for troops to be equipped with otherwise back-breakingly heavy sensor gear or – as Hulc offers no physical protection in itself – the sort of body armor that simply impractical for a soldier on foot to carry. ‘The basic problem with exoskeletons still is you need about ten kilowatts of power to run a typical load-bearing, armor-protected exo-skeleton.The Soldier needs to be able to run it for ten hours to make it mission capable because if the power runs out, an exoskeleton becomes a massive impediment to ability rather than a bonus. Concurrently Lockheed is investigating electro-chemical and solid oxide fuel cells to solve this problem, of developing a ‘long-range HLC’ with a 72-hour battery life and bursts of speed up to 10mph (16 km) per hour. Meanwhile, Defense Advanced Research Projects Agency (Darpa) is testing Warrior Web – a wetsuit-like ‘soft exosuit’ designed to be worn under the soldier’s uniform to provide leg and joint support on only 100 watts of power. Alternatively Warrior Web Replaces the titanium frame of battery-sapping hydraulics, with computer-controlled textiles and wires that provide orthopaedic support as well as powered robotic systems in the legs reducing fatigue. Also being developed is Armour augmentation. There are ongoing experiments in liquid armor, for example, which harden on impact but remain flexible enough to allow the soldier free movement, and nanotechnology, which allows materials to be manipulated at atomic, molecular, and supramolecular scale. In a liquid armor body system liquid hardens on impact in its products. The liquid is called Shear-Thickening Fluid (STF), and instantly hardens upon impact at any temperature, this provides protection from penetration by high-speed projectiles and additionally dispersing energy over a larger area. 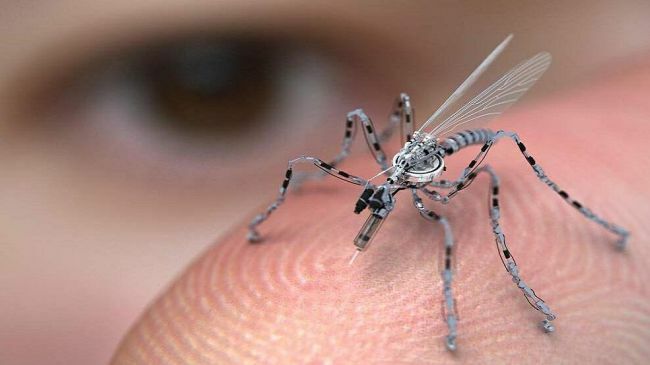 Weaponised Nano-technology. In Engineering products to a nano-scale you can create vastly more resistant and strong materials, because they don’t have any imperfections and you can design a lattice structure instead of having to either kiln something or cast something. Carbon fibre-infused ceramics can effectively be developed at a nano-scale using these principles. A perfect lattice structure can be built resulting in a seamless integration between materials so it’s more stronger than something that’s made using more typical engineering methods. sniper round that can alter its course mid-flight on its way to its target, changing direction in mid-air in response to a target’s movements. 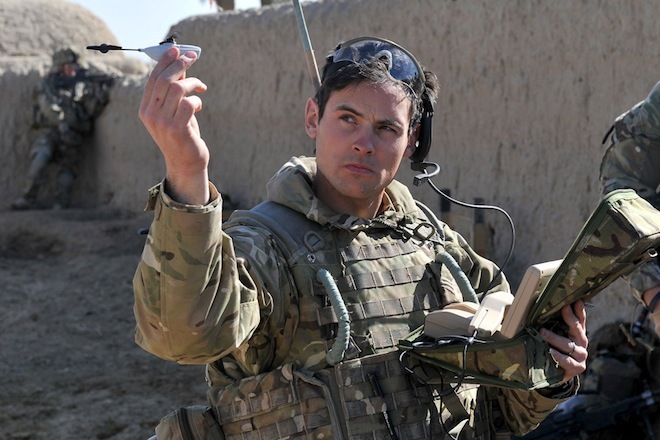 In response for military snipers, acquiring moving targets in unfavourable conditions, such as high winds and dusty terrain commonly found in Afghanistan, is extremely challenging with current technology, Darpa has developed the first ever guided small caliber bullet. The main focus of these super soldier weapons systems for standard infantry is going to be an array of sensors. For example combinations of thermal and infrared vision aids for night vision. At the moment soldiers tend to use infrared, your standard green night vision to see and move around, but when they’re actually engaging targets at night, they use a thermal. toward smaller highly specialised armies , soldiers soldiers will have to rely more on machines rather than man-power for backup. 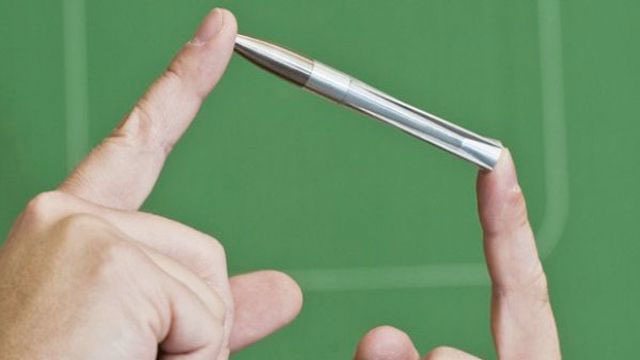 Technology like the microdrone called a Switchblade, which can be carried in a backpack. Carried in a tube, it is launched in the field and with the use of a set of first person-view goggles the operator can see what it sees. 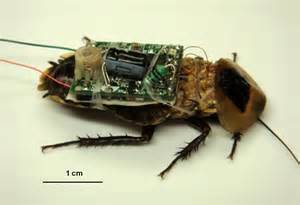 Equipped with a grenade sized warhead this sort of smart microdrone technology may be the only back-up a soldier may need in the field. While a soldier’s ability to scan, transmit and receive more detailed information on the battlefield will increase, The potential disruption caused by hacking and jamming technology will also ensure that this reliance on technology will also become its greatest weakness. In the field the technology offers greater capability for soldiers to connect, link up, with for example, helicopters that are coming to give them support, or fast jets or vehicles in order to increase their situational awareness. This can increase the effectiveness of operations but it must be weighed against the fact that you can’t rely on electronics, particularly networked electronics that can be hacked and is susceptible to crash . Tell me what you know of teleportation and military applications?